May 1991 John Key is interviewed by the Serious Fraud Office, they were investigating the failed company Equiticorp and it’s executives’ dodgy dealings, including a series of faux foreign exchange transactions carried out by Key’s old employers, Elders Merchant Finance. His ex-colleague, Paul Richards was facing fraud charges. Key was asked to corroborate Richard’s evidence about a ‘lunch’. I propose the entire statement is a fabrication, the lunch never took place and that Key had left Elders in 1987, just like he told media in 2007. When his statement surfaced in 2008 however, Key quickly claimed he’d simply gotten his dates wrong and meant to tell media he left Elders in 1988 – funnily enough – just like his fabricated ‘SFO statement’ said. 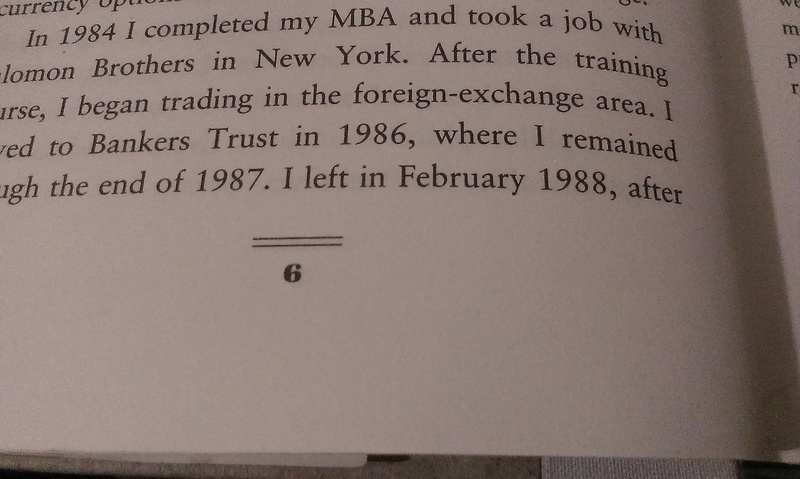 If Key told SFO he started working at a company in 1988, but his own and that of his then boss, evidence suggests it was 1987, then he has misled the investigation. One week before the 2008 election Key lies to media and voters and calls any claims to the contrary as ‘attack politics’ from a desperate left. New Zealanders’ deserve an explanation. John Key did you lie to the Serious Fraud Office? Which raises another serious question; John Key did you…? Twenty-six years ago last Sunday it was September 7 1988. The date is not renowned for much other than being the day Afghanistan’s first ever astronaut returned to earth. New Zealanders however might be more familiar with it. We were told it was the day currency traders at Elders Merchant Finance in Wellington had completed the last of the now infamous ‘H-Fee’ sham foreign exchange transactions. We learned the importance of this in the lead up to the 2008 General Election. Rumours of a signature on a court document that could possibly tie the leader of the National Party John Key an ex Elders employee, to those fraudulent events, had seen Labour Party president Mike Williams racing to Australia in pursuit of it. The ensuing publicity threatened to derail Key’s chances of leading the National Party to victory, but as he explained it, he knew nothing of the New Zealand leg of the H-Fee transactions as he started with Bankers Trust the week before. Key’s statement to the Serious Fraud Office investigation was seen by media, and quotes from it were reported as confirmation that everything Key was now telling us was true. They even served in helping to correct a mistake from 2007 where Key said he had accidentally told a reporter he had left Elders in 1987, when his last day there according to his statement, was actually 31 August 1988. Now I realise what I’m suggesting may be uncomfortable for some but the hugely popular incumbent Prime Minister of three small Pacific islands somewhere to the bottom of the earth may have misled voters, and if true, that is serious enough in itself; but there may be wider implications here. This is the same impossible timeline Key and Paul Richards (Key’s ex Elders colleague and friend) had given to the SFO investigation. Please note too, when I say Serious Fraud Office that also includes Australia’s National Crime Authority. The SFO and the now defunct NCA worked closely together to unravel the fraudulent Trans Tasman scams. Their combined investigation led to a successful H-Fee guilty plea in Australia and a prison term for Ken Jarrett, an executive at EMF’s parent company across the ditch. 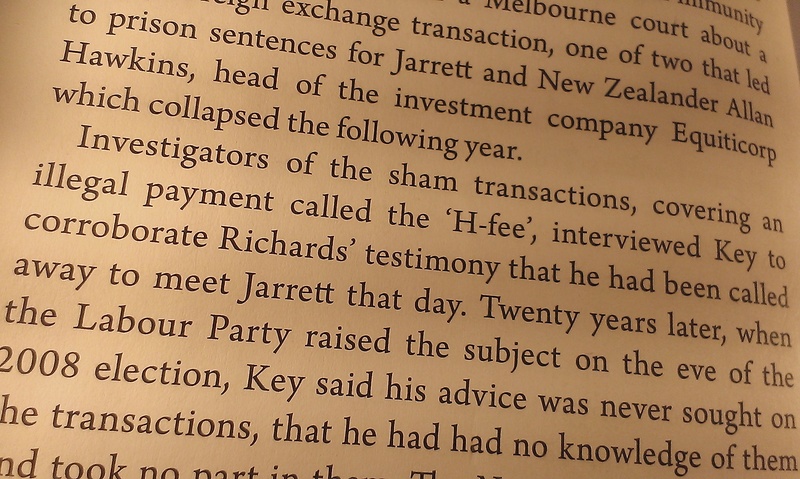 When Williams’ trawling of the Australian court documents unearthed Key’s statement to the SFO, we learned Richards and Key had told investigators they could be assured of the date for an event from some years prior because Key was moving to Auckland the next day to take up his position with Bankers Trust. 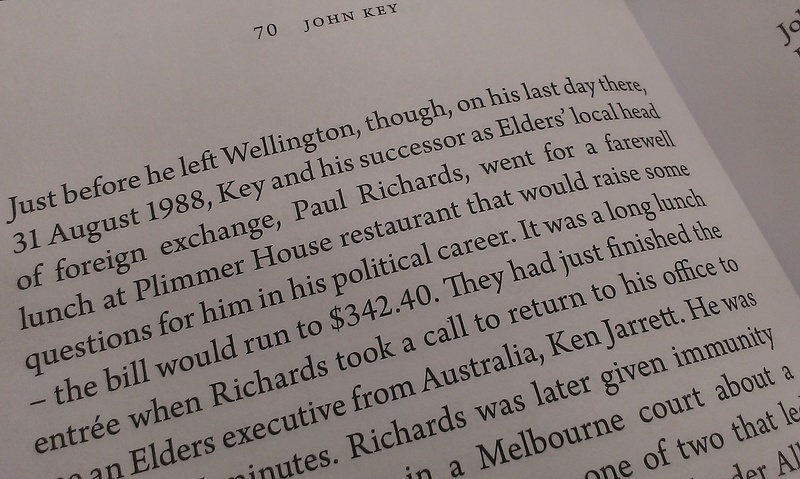 Richards claimed not long after he and Key had sat down for Key’s good bye lunch he was called back to work because Jarrett had unexpectedly turned up at the office. Key allegedly waited 45 minutes for Richard’s return and when he did they say they continued with their celebratory send-off. Funnily enough Jarrett’s lawyers, albeit for the defendant whom Richards had immunity for testifying against, suggested Richards’ evidence which differed vividly from Jarrett’s (and others) recollections of that period, was completely made up; as was Key’s subsequent collaboration. It has been reported Richards too ended up at Bankers Trust, just not when that was. Were Key and Richards working together in November 1990 when Richards was first interviewed by investigators? Were they working together in May 1991 when Key was? 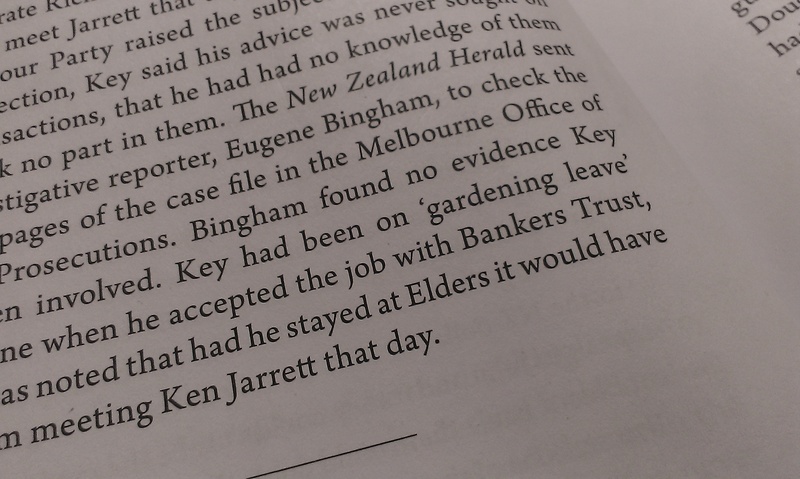 Key has said (NZH, October 2008) after resigning from Elders on 24 June he immediately went on ‘gardening leave’. He spent the time until his last day 31 August he says, “[travelling] to Australia to meet with Elders people, took holidays, spent time at home and worked on the takeover of a stockbroking firm.” But in November (NZH, 2008) we’re told before joining Bankers Trust, “he collaborated with the firms New York office in some heavy duty currency speculation.” He has claimed Bankers Trust bought him out of a three year contract. They would not have needed to buy him out of a three year contact in 1988 as he would have been at the end of it. So, John Key, I again find myself asking, I asked him this in 2011 as well, you can read all about it here, did you lie to the Serious Fraud Office? If the answer is not yes, then the alternative is, I have to believe, the Prime Minister of New Zealand and his ex boss, now Chair of New Zealand Super Fund, concocted for the media an elaborate yet unnecessary back story of a nonexistent professional relationship with a dodgy American currency raider? I cannot imagine any solution where inventing an imaginary relationship with Andrew Krieger was the answer to the problem? It is my belief that Key resigned from Elders Merchant Finance in 1987, not 1988 as he has led us to believe, leaving not long after EMF’s parent company Elders IXL announced its plans to restructure effective from 1 July 1987. The company announced their restructuring in a press release dated 24 June. I believe it was during this time of uncertainty after the company’s restructuring that Key was approached by his future boss, Walker, to come head Bankers Trust’s soon to be established dealing room. Although Bankers Trust did 70% of their trades outside of New Zealand (NBR, June 1987) they wished to set up a local branch here and thus in September 1988 applied for a New Zealand banking licence. If Walker did buy Key out of his three year contract sometime in late August/early September, it allows for three months of ‘gardening leave’, i.e. October, November, and December 1987 for the so called ‘heavy duty currency speculation’ he apparently collaborated on before officially starting with Bankers Trust. Secondly this timeframe is the only plausible opportunity for Key to have worked with Krieger before Krieger resigned. 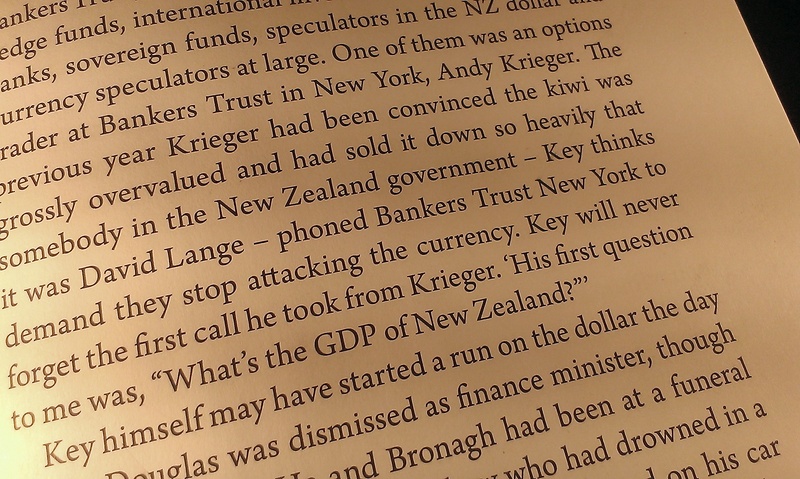 Which raises another serious question; John Key did you participate in Krieger’s 1987 run on the New Zealand dollar? His whole life is a lie, I’m therefore surprised he can remember any of it…. Does this mean John Key is a criminal? If he as lied to the SFO then yes he is. Lying to or misleading an SFO investigation is an offence punishable by fine of $15,000 or 12 months imprisonment. In 2008 while on gardening leave John was working on a takeover of a stock broking firm? It would be interesting to know the name of the stock broking firm? Because it was 2008, the day after National Party took office that Bill English announced that Southern Cross Finance was a Ponzi scheme. No ‘gardening leave’ in this instance refers to events from 1987/1988. John Key has always lied. what is wrong with NZers, are they scared of him, i think not. John has never done anything for our country with out crying or begging the american president to help. his cabinet files behind him because more powerful people from outside of NZ are behind John, and they can’t do anything. GET RID OF JOHN KEY PERMANATELY FROM THE PRIME MINISTER JOB, and put a more trusting prime minister in charge. THE PEOPLE OF NZ NEED A TRUTHFUL PERSON FOR THE JOB. come on NZers have your say NOW and put a STOP to a blubbering man.